Here is the opportunity to ask Dr. Murali Doraiswamy, one of the world's top experts, a question about Alzheimer's disease, dementia, or memory loss - right now. Dr. Murali Doraiswamy is one of my favorites. 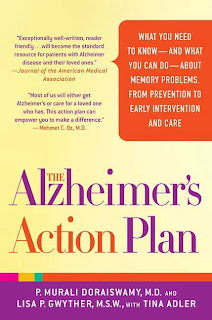 I benefited greatly from his book, and I recommend it to all Alzheimer's caregivers. I used the book so often that I wore it out. Dr. Doraiswamy is now answering question over on the New York Times website. I get medical questions via email and in the comments section all the time that I am not qualified to answer -- I am not a doctor. If you feel like you are not getting a straight answer from your doctor or neurologist this is your chance to ask an expert a question about Alzheimer's treatments, medications, symptoms, memory lossm, or any other medical question about Alzheimer's or dementia that is on your mind. For example, you could ask what your doctor should have done to rule out all other potential diagnoses other than Alzheimer's. P. Murali Doraiswamy is a Professor of Psychiatry & Behavioral Sciences, at the Duke University Institute for Brain Sciences.